A few years ago Tiva was one of the many strays roaming the streets of Taiwan. We have all seen them-- the disease ridden dogs that shed skin and fur in equal amounts as they scavenge trash from vacant lots, irrigation canals and construction sites. When I first moved to Taichung, it was not uncommon to see packs of these animals in all shapes and sizes roaming the now swanky seventh district like some kind of canine Road Warrior dystopian fantasy. But it wasn't fantasy. The problem was so bad that in the aftermath of the 921 earthquake, I actually witnessed a pack near Dakeng attempting to scavenge meat from a human victim along the roadside. Before the high rises...before Mitsukoshi...before Maserati and Aston Martin moved into the neighborhood...it was Dog Town. The area where Forest Park is now, was a large concrete and dust parade ground that would attract marauding packs of former pets. Chihuahuas leading gangs of Akita and Husky. It was as ridiculous as it was sad. Unwanted pets were just turned out onto the streets. Many of them had no business being pets in Taiwan in the first place. Who really needs an Alaskan Malamute locked up in an apartment for twenty-three hours a day? Tiva was one of those street dogs and she would eventually be plucked from a garbage dump and later adopted by a dog loving couple far across the Pacific Ocean in Seattle...where this writer originally hails from. Not only would Tiva be adopted by a caring family in Seattle, but she would also find she had been adopted by a couple of touring cyclists from Seattle. Willie Weir and Kat Marriner have made cycling a part of their lives. Kat is a freelance graphic designer (and also makes a mean blueberry pie) while Willie writes for Adventure Cyclist Magazine and engages in public speaking on the many aspects of cycling. 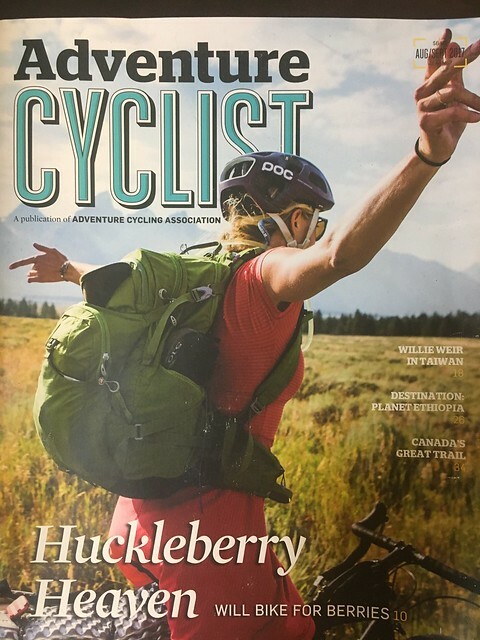 Together they travel the world by bike and some of their adventures make it into print. The catalyst for coming to Taiwan started with Tiva. Tiva is not only a rescue dog from Taiwan...she is also a Formosan Mountain Dong--a highly intelligent and athletic breed that had been used for millennia by Taiwanese indigenes for hunting wild game, like deer, boar and muntjac. Kat and Willie hoped to tour Taiwan while getting in touch with groups that rescue strays for adoption while learning about the land of Tiva's birth. In a chance encounter at an intersection in the Beacon Hill neighborhood of Seattle, Willie and Kat ran into my cousin, Ryan, who is also a cyclist and cycling activist in the area. When discussion turned to a Taiwan trip, Ryan brought me into the mix where I did my best to offer any advice necessary to ensure the trip would be worth the air ticket. My greatest fear for any visiting cyclist is that they will ride the wretched Highway 1 all the way down to Linbian. It happens. 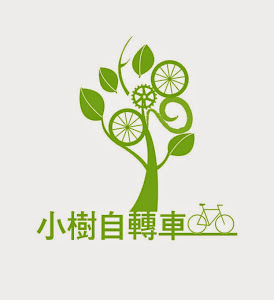 I have a lot of pride in Taiwan and it would be a shame if people came all this way and never got to see what makes this country such a gem for cycling. A crying shame! Mountain Dog? I thought Taiwan was just an overcrowded island overrun by industry. Oh, and I thought it was flat. We were both on the verge of bonking, and the air at 8000 feet was enough to send shivers down our sweat-soaked bodies. Sunset approached. The area was described as a roiling cloud forest, and true to form, the breeze shifted and magnificent peaks appeared. The mist-filled valleys below us glowed orange with the setting sun. We jumped up on some boulders and watched the most incredible sunset display I've seen in all my years of travel. At one point the mist shot up like a geyser from below, obscuring everything. And then two minutes later, it cleared and the mountains around us burned orange-red again. Perfect timing. Absolutely, stunningly memorably perfect. We left Mary's place and contacted Andrew, who had already made some adjustments to our route knowing that we would be visiting another dog rescuer in the city of Toufen. This became a pattern that made for a wonderful (and physically challenging) trip. Andrew loves the mountains and the small, lonely roads, but dog rescue organizations are mostly in the cities. So rather than take the direct, flatter, faster route between cities and our dog connection, Drew would route us via his favorite mountain climbs. This gave us a unique "best of" tour of Taiwan. Taiwan is progressive. It has a woman president. It has single-payer health care. It leads Asia in LGBT rights. At last count 38 precent of its legislators are women. Taiwan is small. This island has the feel of a continent in a vice. The elevation and ecological diversity makes for a constantly changing countryside. 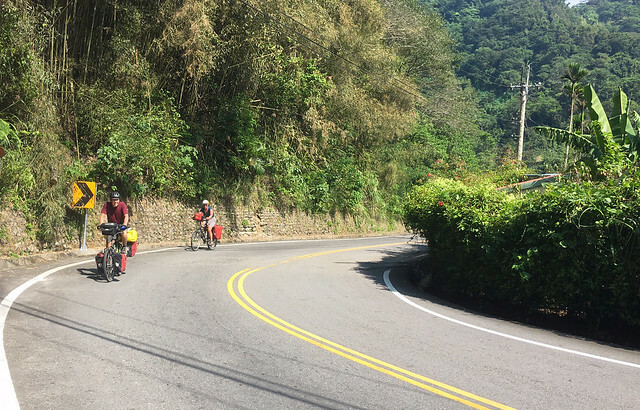 On any given day you can begin your ride in a jam-packed city, pedal through rice fields, and then climb several thousand feet through orchards and small villages up into the cloud forest. You can find out more about Dog Rescue in Taiwan at Mary's Doggies. 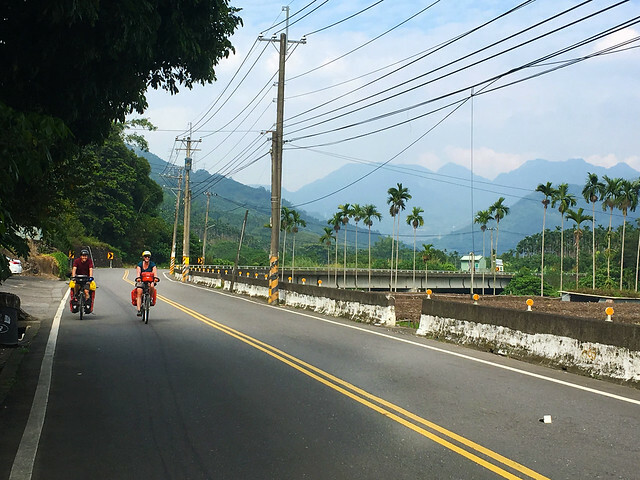 Willie was not the only Weir to bring some adventure cycling to Taiwan. 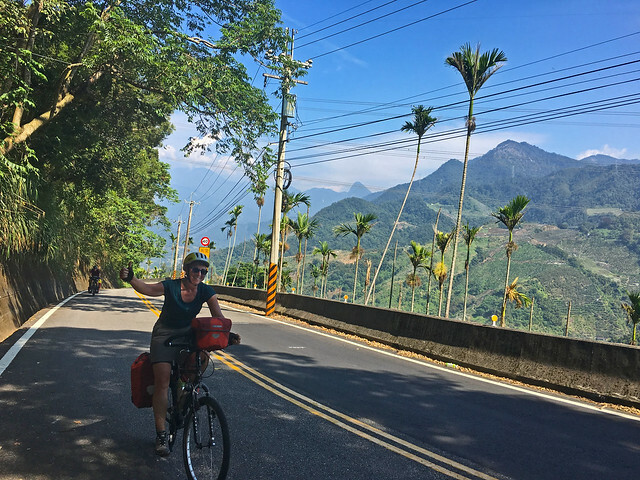 Canadian cyclist and blogger Tara Weir from The Adventures of Margo Polo also followed a similar route through the secluded hills of western Taiwan. "We were both on the verge of bonking..."
I'm assuming the writer meant "bonking" in the cycling sense, but there is another, more British definition that left me snickering like a schoolboy.